You want vitality and to feel the life pulsating within you. You want to look good, because you know: True beauty comes from within and is visible to the outside. 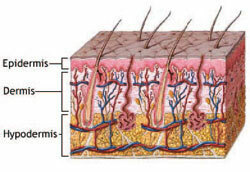 Our skin is regarded as a mirror image of the whole body. Who would not want for as long as possible a young, attractive and well- kept appearance! The conditions are extremely favourable - the skin has the ability to renew itself regulary. This, however, requires energy and especially oxygen. Without oxygen there is no energy for cell renewal in the skin. If there is sufficient oxygen, nutrients and vital substances can be converted into energy. and as you watch your skin, you begin to look tired and worn out, especially in the face and the first wrinkles appear. The fact that we age we are unable to prevent. Your skin even in old age appears fresh and clean- but you should do something from the start. With the OxySkin oxygen beauty massage your facial skin gets a fresh special oxygen treatment, which triggers an invigorating energy boost. No wonder, if your skin breathes it. After the first application you will have a freshness and elasticity feel that will surprise you and will not want to let this go.